You must be clicking several pictures or recording 4K videos from your iPhone or iPad. All these photos and videos are saved in the internal memory of an iPhone, to backup all these media files, you may use iTunes to transfer the files to the computer. While syncing or the memory crash there will be a huge risk of loss your media files. And the worst part is that, on unauthorized devices, Apple iTunes doesn’t allow you to play these purchased video music audios. So to overcome this issue, here we recommend WinX MediaTrans. Please follow this article to learn more about this software. WinX MediaTrans is the best iPhone manager software for all your photo video music audio files transfer needs. By using this software, you can easily transfer photos, music files, DRM movies, etc. between PC and iDevice. Some of the key highlights of this software are listed below. You can easily remove/decrypt DRM from iTunes purchased movies or music and export to PC. Transfer and manage music files from music manager. Decode DRM music from iDevice. Edit Artist and Album info. Record and Transfer 4K pictures and Videos. Import audio iBooks to iPhone purchased from iTunes. Easily convert EPUB to PDF. Transfer videos of any format to iPhone. Manage to create voice/ringtone and voice memos. Mount iPhone as a USB drive. If you are a regular apple services user such as iCloud or iTunes, you should have noticed DRM files like PDFs, Epubs, Ebooks, Videos and Music files. These media files sold in iTunes are protected using Apple own DRM solution. So to play those files, you need to decrypt them. 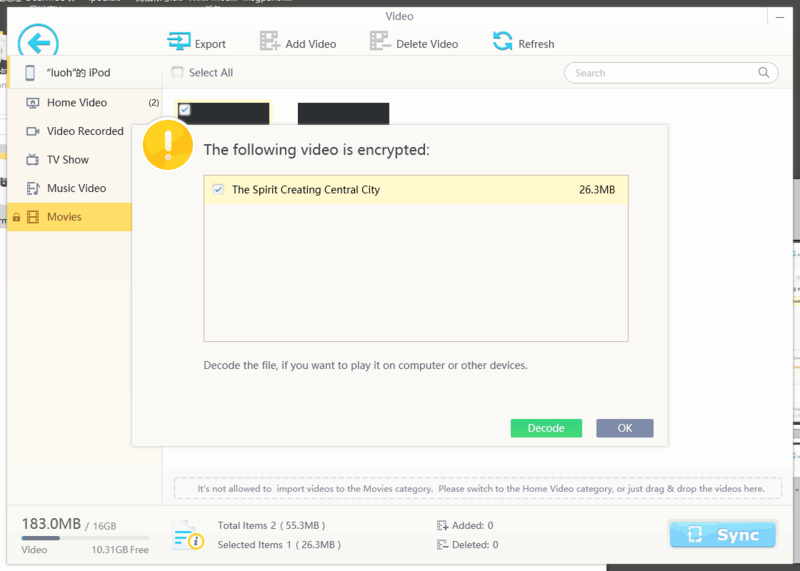 How to Decrypt DRM movie video, audio or iBooks purchased from iTunes store? Then WinX MediaTrans is the best option. Please follow the steps listed below. Download WinX MediaTrans and install it on your Windows PC. Open this iPhone transfer software, it will remind you to connect your Apple device to your PC using a USB cable. Click the Video section; you will go to the screen showing the category of your movie video. Choose your iTunes M4V video files (DRM tagged video), and then click Export. Now a screen will be displayed saying that it is encrypted and you can decrypt it using “decode it” option. Click on “Decode” button, and it will automatically start decoding DRM movie. Once the movie is DRM free, it will be saved in the destination folder. Note: If your computer has any DRM movie video from unauthorized iTunes account, you can also use WinX MediaTrans to remove the DRM and convert it to common MP4 format for playback on any devices you want. To remove DRM from iTunes music or M4B Audio Books the same steps can be followed as described in movies. But you need to select “Book” button in iBooks managing interface for decoding DRM-protected audio books to DRM-free. To remove DRM from iTunes music, you need to click on Music Manager where all the music files will be listed from iPod. Click the purchased option to access the purchased music files. Select the desired music file and click on the export button and next on click on decode it. Now wait for it to be decoded, and the same can be accessed on your computer destination folder. Additionally, it can manage ringtones, Ebooks, Voice Memos, iTunes U, Podcast in all the old and latest IOS devices. The high-resolution videos such as 4K video taken at 30fps are subject to storage so this software will backup them, so you don’t have to worry about storage. The best part about this software is it can manage ringtones and Voice quickly, i.e., add/export/make iPhone ringtones and convert them to AAC or mp3. More, you can create/modify playlist which can be done easily by using drag and drop option. WinX MediaTrans also works as iPhone video converter software. By using WinX MediaTrans, you can easily convert iOS-unsupported video & music files to your iPhone iPad. Open WinX MediaTrans iPhone converter, load your unsupported files on it, or you can drag your files to this converter as well. This iPhone converter can convert other video formats to mp4 format, so you can also load MOV or FLV files. Once you are done with the conversion procedure, you are free to play with your captured videos. You can correct the colors with various software, and then you can put it in order with movie maker. Easy, isn’t it? The giveaway version enables you to free transfer unlimited files from your iPhone to computer. And, you have the chances to win lifetime upgrades full version. The developer will choose ten winners per day. So hurry up and grab your free copy.